The most prestigious of scholarships, the President’s Scholarship is awarded to ‘students who have gone beyond excellence in academic pursuits and co-curricular activities to distinguish themselves,’ and who have a ‘strong ethos in public service’. We conducted an interview with this year’s Rafflesian President’s Scholar, Tan Kuan Hian, now studying liberal arts at Johns Hopkins University to find out more about him. 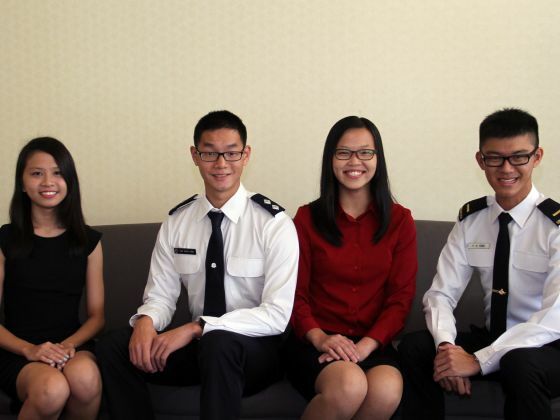 President Scholars 2015: Etsuko Lim Tze, Tan Kuan Hian, Clara Lim Shu Qi and Russell Ewe Yuhang. Photo retrieved from TODAYOnline. Tell us a bit about yourself. What class were you from back in RI and what was your CCA? 14A01C, in the Humanities Programme. From Year 1-4 I was in the RIPB, the Raffles Debaters, and Raffles Athletics. In Year 5-6 my CCA with RI was just Track and Field, although I debated with the national team. What are your thoughts on winning the President’s Scholarship? It’s hard to articulate my thoughts and feelings on winning the President’s Scholarship. The first is that I think it’s a bit misleading to say I, or any of the other recipients, “won” the Scholarship – rather, it’s a huge honour that we’ve been lucky enough to receive. I think anybody who begins by viewing the Scholarship as a reward to win is probably not in it for the right reasons and also unlikely to receive it. Linked to this, the second big thought was surprise. I don’t think anybody expects to receive the Scholarship, and I definitely didn’t. I was really happy to receive the Scholarship, and a large part of that happiness was because it was totally unexpected as an honour. Upon further reflection I think the President’s Scholarship is an opportunity, more than anything else, to serve in the public service. In some senses my thoughts on it are the same as mine are on the Public Service Commission Scholarship and the Singapore Police Force Scholarship – they are opportunities to begin a career in the public service, and fundamentally involve a responsibility to serve Singapore. In RI, you were a prominent debater, having been in the WSDC team for two years running. What importance do you think debate had in your RI experience, and do you plan on continuing to debate in university? It’s too early for me to say whether I want to debate in university. Debating in the US is quite different from debating in Singapore and debating internationally, format-wise, so I’ll spend some time exploring it along with other options. I think it is difficult to overstate the importance of debating to my RI experience, and in general to my development from Year 1-6. But I think that is true of any activity, for any student, if that student invests heavily in that activity and gets involved with the community surrounding that activity. Debating is perhaps unique in that it trains skills that are very applicable in real life and in schoolwork, but I think many other activities are just as meaningful. In fact, people tend to focus on the fact that I debated a lot, when I think that my running track was just as important. Obviously hurdling has limited classroom or real-world applications, but the physical challenges of a sport provided a different sort of training and release than the intellectual rigours of debating. Perhaps more importantly, being in track helped me make loads of friends (whether teammates or just people in the gym) whom I don’t think I would have met if I’d just stuck with debating and being in the Humanities Programme. It’s not that any group of friends is better to have, but I think it was very important for me that I had multiple groups of friends with different interests and views, so that I had more diverse views and patterns of behaviour. Upon leaving RI, did you also have any regrets? Would you have done anything differently? There are many things I would have done differently – many times I could have been nicer, more charitable, more respectful. I think anybody who says they have absolutely no regrets about a period in their lives has to be lying, or has to be the second coming of whichever religious figure you believe in. But more broadly, in terms of really major decisions that shaped the path of my life in RI and beyond, I don’t think there’s much I would do very differently. I would have made a stronger effort to get to know even more people, because RI is such a big school, and build stronger relationships with school staff (like the staff in the SAC, canteen vendors, and of course teachers). But in terms of big decisions which I regret, I do wish I had been more focused and put in more effort into track in Year 1-4, because it was only in Year 5-6 where I took training more seriously. I’d also be more focused and work harder in debating, because there were periods where things were tough and I got tired of debating – which is I think understandable, and no matter what the activity is there will always be highs and lows, but I could have done better during the lows. Overall, though, I had a great time in RI and there isn’t much I really regret. Were there any moments in your RI experience which you found especially significant in shaping who you are as a person? I think sometimes we fixate too much on individual moments as being crucial in determining who we are, when really it’s in the daily grind that we find ourselves. There were some random chance meetings and conversations which helped me a lot by providing opportunities I otherwise wouldn’t have had, but then again I prefer not to fixate on the vagaries of life because we can only remember the coincidences that happened, while those that didn’t could be just as important. In general, do you have anything to say to our Rafflesian readers, and any tips they could keep in mind for the future? The PSC is far too discerning to fall for interview tricks or buy rehearsed answers, so if anyone’s looking for an interview cheat-sheet I’m sorry to disappoint you – it doesn’t exist. As far as interview tips go, there really isn’t much new I have to say. Read widely (not just the Straits Times), have an opinion on issues that you can defend, and think very hard about why you want to join the public service and take up the scholarship. For more general advice, be really committed to what you do, no matter what CCA or project it is. That commitment will not only shape you for the better, it will often yield results as well. Build relationships, and I use the word build advisedly – friendships don’t just appear and stay. They take work to maintain, and having friends for whom you are willing to put in that work is always a blessing. This helps with applying for PSC scholarships I guess, but that’s because it’ll just make you a better person. I’m working on doing these things in my own life, too. Finally, remember that there are loads of people out there who are just as and quite often more capable than you are, and that that’s completely fine. Be acutely aware of what you can and cannot do. If you can do something, don’t be ashamed about it. If you can’t, don’t be ashamed either – acknowledge it, and then decide whether you want to become able to do it, or whether you’d rather focus elsewhere. There’s no need to do everything, and no need to be the best at anything. I think accepting that can sometimes be difficult, but it’s important to do, because it’s true. Raffles Press wishes Kuan Hian the best in his future endeavours.